Miniflex was pioneered by PPC to be the world’s only hand-pushable fiber optic cable after they listened to their customers’ pain points. Customers explained their average subscriber drop is less than 50m in more than 80% of the cases and the majority of network faults came from poor field splicing and badly installed drop cable. 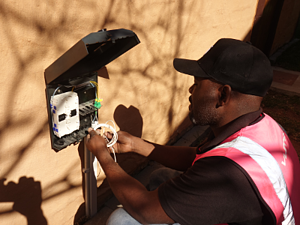 By adopting Miniflex, the FTTH providers gave a proven solution to their installation crews that removed expensive blowing equipment, expensive splicing equipment and more importantly, the scarce resource of highly-trained engineers that may still be prone to installation errors. Since July 2012, PPC Broadband has strengthened its partnership with Mustek S.A who has invested heavily in local stock, but most notability in four pre-termination lines that have generated more than 50 jobs locally in Johannesburg. The partnership has also empowered more than 50 contracting firms who provide installation support and service to the FTTH providers and upgraded more than 250,000 customers to high-quality fiber optic services that will enrich their lives with a multitude of new lifestyle options.